This is my second pair of these laces. They are hard to put in for old arthritic hands, so it takes me awhile but well worth it. The shoes fit snug but the laces give with each step. I can slip in and out of shoes very easily. These are much better than Hickies (which kept breaking). These work great. They are a little difficult to put in (with arthritis) but worth the effort. These are so much better than Hickies, which keep breaking. I have used these for about a year (since I injured mu knee). I love them! They can be adjusted to get that perfect fit. I recommend them to my patients who have problems with tying shoes due to arthritis. My orthopedic surgeon noticed them & really liked the concept. Several of the nurses wanted to know more about them & where to get them. Of course, thegrommet.com! My first pair for my walking shoes. I loved them so much I got them for both pairs of my work shoes (I am a RN). I love being able to dial my fit. Awesome product! My 9 year old constantly had his shoes untied. Also had trouble changing for phys ed quickly. These laces work perfectly and look cool too! I bought these for my grandson because he always walks around with his shoes untied! These make him look much neater! I purchased a pair last year for my daughter for Christmas and although they were hard to put onto the lace holes on her sneakers, she loved them. This Christmas I bought both her and my son-in-law a pair and she was so excited to get a new pair. They both love them. I have tried several kinds of stretchy laces. These are the best! So much easier to lace up the first time, vs. others I have used. Makes it super easy for my husband to get his Nike shoes on. Bought the blue ones, and the black ones. No regrets trying them. Maker and dad, Mike Gonzalez couldn’t untie his son’s frozen laces on a winter day. That prompted him to create a better solution for shoe wearers everywhere. 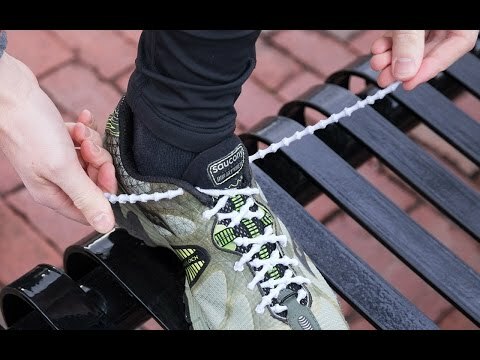 XTENEX ACCUFIT Laces give your shoes a custom fit. Lace them up as you wish—roomier in some areas, snugger in others—and enjoy the ingenious way they stay put while still offering stretch or support where you want. 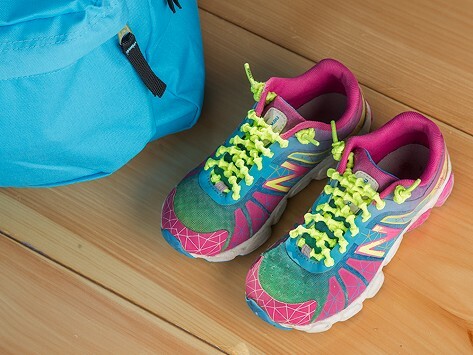 Plus your shoes will easily slip on and off, no tying or untying needed. The funky looking laces have knots every few millimeters. Stretch the laces to thread them, and the knots flatten out and disappear. When you release the tension, they reappear to keep your laces in place.